It's no secret that the kids from Stranger Things like a good musical number, but it was certainly proven again last night (November 8) when another late-night TV host exploited the youthful purity of Mike, Dustin, Lucas and Will for another segment. The actors — Finn Wolfhard, Gaten Matarazzo, Caleb McLaughlin and Noah Schnapp — stayed up past their bedtime to join The Late Late Show host James Corden in a clip detailing their history together as a Motown supergroup. In a Behind the Music-esque mini documentary, we get to hear the origin story of the Upside Downs — plus their ensuing downfall and reunion. It culminates with a live performance of Motown classics like "I Want You Back," "My Girl" and "Reach Out I'll Be There." Despite the pop culture ubiquity of the young stars (and their cracking voices), they're still too charming to even get mad at. 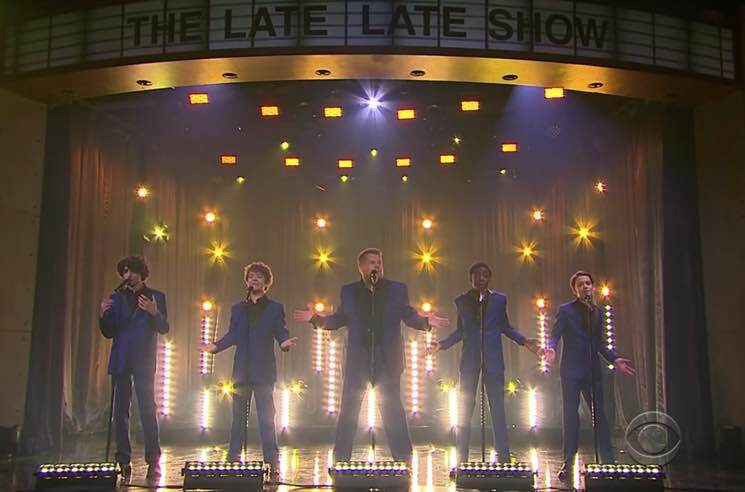 Check out the Late Late Show clip below. Season 2 of Stranger Things is streaming on Netflix now, but if you haven't finished binge watching it, you can totally spoil it for yourself by reading about the Duffer Brothers show's suspicious similarities to Harry Potter first.